Sandra Bullock both brought the house down and up to its feet into a standing ovation when she started off her acceptance speech for having won the Best Actress Academy Award for The Blind Side with her wonderfully self-deprecating query, "Did I really earn this, or did I just wear you all down?" Many pundits, including Variety, the so-called "Bible of showbiz", are now touting Bullock as the frontrunner for another Best Actress Oscar for her stunning work in Gravity, a virtual one woman tour de force show for much of that film's excruciating running time. But 2013 also saw Bullock take on a decidedly less ambitious role while simultaneously proving how well she plays with others, in the raucous, foul mouthed and often hilarious Paul Feig comedy The Heat. Paired with Melissa McCarthy, Feig's Oscar nominated actress from his recent Bridesmaids, Bullock in fact takes something akin to a back seat to McCarthy's over the top antics, becoming the straight woman for an unending series of insults and physical comedy aimed at her by her zaftig counterpart. First time screenwriter Katie Dippold, a veteran of television's Parks and Recreation, had decided she wanted to reinvent the "buddy cop" genre in gynocentric form, and rather surprisingly, while her script was very quickly picked up by Peter Chernin, a studio deal took some wheeling and dealing, since there was a rather dunderheaded fear that two females headlining a cop comedy wouldn't be an easy sell. McCarthy has become one of the more unlikely superstars of the past few years, and her presence, especially after her Bridesmaids triumph, may have at least whetted the appetites of the Hollywood bean counters who more often than not make the "important" decisions, but without the tamped down presence of Bullock, the fact is The Heat might have seriously run off the rails. It's the interplay between these two very different characters that generates most of the comedic—yes—heat in this film, with Bullock's by the numbers FBI Special Agent Sarah Ashburn repeatedly running smack dab into the force of nature of the much less structured Boston police detective Shannon Mullins, portrayed by McCarthy. Dippold and Feig give us two introductory vignettes which quickly summarize the vast differences between the two focal women. First up is Bullock's Ashburn, who is commanding an FBI raid of some suspected drug and gun runners. Surrounded by a coterie of male agents, Ashburn quickly demonstrates in a somewhat arrogant manner just how stupid they've all been (this conclusion branching out to the drug sniffing dog accompanying the team as well). She's obviously highly efficient and well intentioned, but she also has zero people skills. McCarthy's Mullins on the other hand has people skills decidedly in the negative territory, as evidenced by her hilarious yet completely inappropriate takedown of a would be john (a fantastic cameo by Tony Hale). Mullins is an obscenity spewing ball of combustible vitriol, but she, rather like Ashburn, is obviously well intentioned if in possession of even fewer social graces than her FBI counterpart. Ashburn, who's angling for a promotion which her boss is reticent to grant her since her colleagues all hate her guts, is sent to Boston to help bring in a drug kingpin, while at almost the same moment Mullins is collaring a smaller fish in the Boston drug network who nonetheless may have information on the ringleader whom Ashburn is after. That brings these two "oil and water" souls together, with Ashburn initially trying to just work around Mullins' violent, foul mouthed presence, but with Mullins, who actually steals a top secret FBI file to get an inside track on the investigation, not taking "no" for an answer. When Ashburn's boss indicates that her ability to work with a local policewoman might mean all the difference between getting her promotion or not, the die is cast and these two are thrust together as unwilling competitive collaborators and nemeses, attempting to ferret out who the mysterious kingpin is. The investigation ultimately involves Mullins' ex-con brother (Michael Rappaport), as well as a couple of misogynistic DEA agents (Dan Bakkedahl and Taran Killam). Dippold has fine comedic sensibilities when it comes to character, even if the overarching plot of The Heat is only too familiar, with nary a surprise along the way. That doesn't mean the film isn't hugely enjoyable, for it certainly is. Bullock's uptight Ashburn is barely able to even swear, while McCarthy's Mullins is seemingly incapable of uttering a sentence without it being profanity laden. The two actually come to physical blows on a couple of occasions, but haltingly learn to work together (just one of too many predictable elements in the screenplay). There are some fairly lame attempts at pathos thrown in with a fairly sappy back story granted to Ashburn, and a hilariously dysfunctional family granted to Mullins (including a nice bit by Jane Curtin as the Mullins grand matriarch). Ultimately this film succeeds due to its expert performances. McCarthy's slovenly, disheveled Mullins is a marauding cacophony of brute force, blasting her way through interviews and repeatedly humiliating Ashburn to increasing comedic effect. Bullock's Ashburn is a study in corporate-think, reciting statutes and insisting that things be done according to the field manual. The collision of these two characters is rather like a figurative train wreck which is horrifying on its face but which is so compelling it's impossible not to watch. The Heat is presented on Blu-ray courtesy of 20th Century Fox Home Entertainment with an AVC encoded 1080p transfer in 2.40:1. Feig reunites with his Bridesmaids cinematographer Robert Yeoman, an increasingly impressive DP whose work with Wes Anderson on such outings as Moonrise Kingdom proves how capable he is at capturing both the grittiness of everyday life as well as a bit of its luster. Aside from just a few establishing shots done in Manhattan, Feig shot the bulk of the film in Boston, and the city looks alternately glamorous (usually from above in some sharp looking aerial photography) or a bit on the dilapidated side when the story gets down and dirty into some sad looking neighborhoods. The Heat's lossless DTS-HD Master Audio 5.1 mix is extremely effective, bristling with surround activity when any of the many source cues are thumping on the soundtrack (Feig recounts in his commentary how the Isley Brothers just happened to come on the radio shortly after he had read the script, and he took that as a sign as to how to start off the film). Welcome to the Bonus Features (1080p; 00:27) finds the always classy Paul Feig indulging in an ever popular fart joke. The following eight supplements all contain brief introductions by Feig, who assumes a different "alter ego" (famous directors, kind of) for each introduction. Mullins Family Fun (1080p; 9:20) includes some deleted scenes involving Shannon's dysfunctional brood, including some that probably should have been in the gag reel. Acting Master Class (1080p; 8:28) features some cast antics. Let's Get Physical (1080p; 6:31) are more bloopers, these all having to do with physical gags. Police Brutality (1080p; 6:43) are outtakes featuring McCarthy. Von Bloopers (1080p; 15:41) is yet another gag reel. Supporting Cast Cavalcade (1080p; 7:44) are outtakes featuring the large supporting cast. Over and Out (1080p; 00:36) finds Feig signing off with another hie-larious fart joke. How The Heat Was Made (1080p; 19:44) is an enjoyable if rote making of featurette. Live Extras gave me a "This Feature is Not Supported in Your Country" prompt. Funny! The Commentary Track In Which the Director of The Heat Talks Endlessly About The Heat. This commentary is available only on the Unrated Version of the film, and finds Feig in typically high spirits, ebulliently talking about various aspects of the shoot. It's a reasonably informative and funny commentary that fans of the film should enjoy. The Commentary Track In Which Melissa McCarthy and Other Great People from The Heat Talk About The Heat. is available on the Theatrical Version and features Paul Feig, Katie Dippold, Mike McDonald, Adam Ray, Jesse Henderson. This is a pretty raucous, very funny and party like affair, with the gang frequently talking over each other and calling each other a variety of patently objectionable names. The Commentary Track In Which Some of the Mullins Family Discusses The Heat is available on the Theatrical Version and features Paul Feig, with what sounds like four of the actors who play members of the Mullins Family (the "introductions" are pretty quick and noisy, and it's hard to make out who's being introduced). One of these is certainly Jane Curtin, who stays in character and disses everyone and everything in sight. Attend the June 23, 2013 Premiere of The Heat at The Ziegfeld Theater in the Comfort of Your Own Home! is a pretty useless supplement capturing audience noise. The Original Lineup from Mystery Science Theater 3000 Comments on The Heat doesn't quite rise to the highest levels of MST3K insanity, but there are some good punchlines scattered throughout this commentary. The Heat is undeniably funny a lot of the time, but it's also a bit too predictable for its own good. Bullock and McCarthy make a very appealing "odd couple", however, and help the film to overcome its more rote elements. This Blu-ray comes with great looking video and sounding audio, and even if most of the supplementary material is nothing other than glorified gag reels, the wealth of commentary tracks is a nice touch. Definitely worthy of multiple viewings. 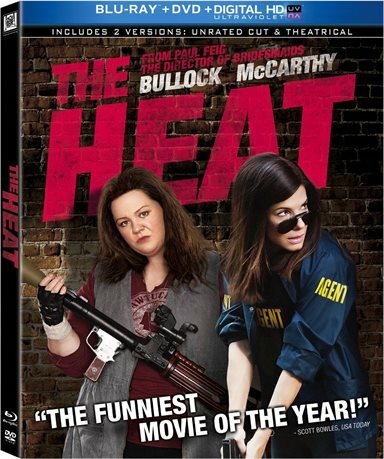 Download The Heat from the iTunes Store in Digial HD. For more information about The Heat visit the FlickDirect Movie Database.